Notice everyone in the family is holding a bird. 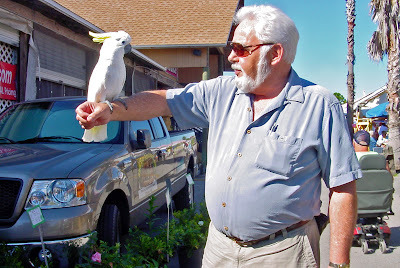 Yesterday, Don and I took a ride up to Flamingo Island Flea Market, one of our favorite places. It was a picture perfect day and we met some people who rescue Parrots of all types. They had a half dozen birds there for the day, out of somewhere near 30 birds. They visit hospitals and nursing homes with them. Such caring people. It warms my heart. Here's Don with a friend.